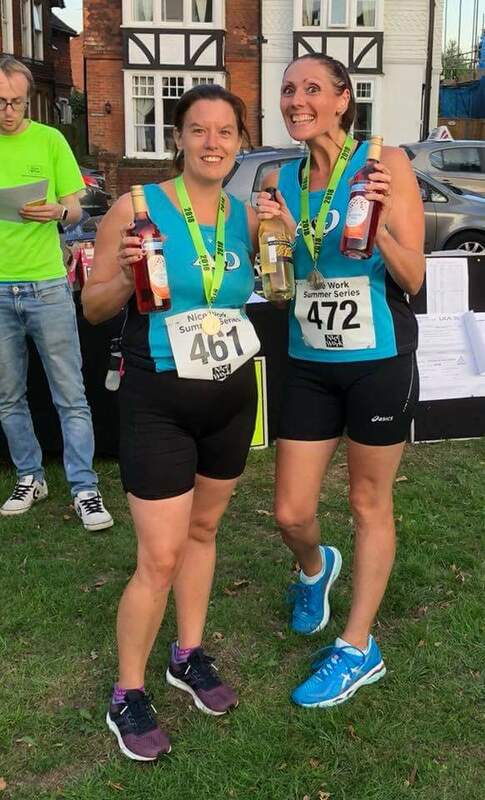 The Podplus Ashford Summer Series drew to a close on Friday night with A&D RRC well represented across both race categories. Carl Jones finished 2nd in the 10k race in a time of 35m:29s, followed by Trevor Kay in 36m:36s (3rd). Ryan Edwards crossed the line in 40m:47s (6th), Keith Haynes was up next in 42m:20s (9th) with Gill O’Connor coming home 1st in age category in 46m:39s (17th), Jaclyn Kay completed the line up in 53m:32s (27th). The 5k race was dominated by A&D as 8 out of the top 10 finishing positions were claimed by club members. 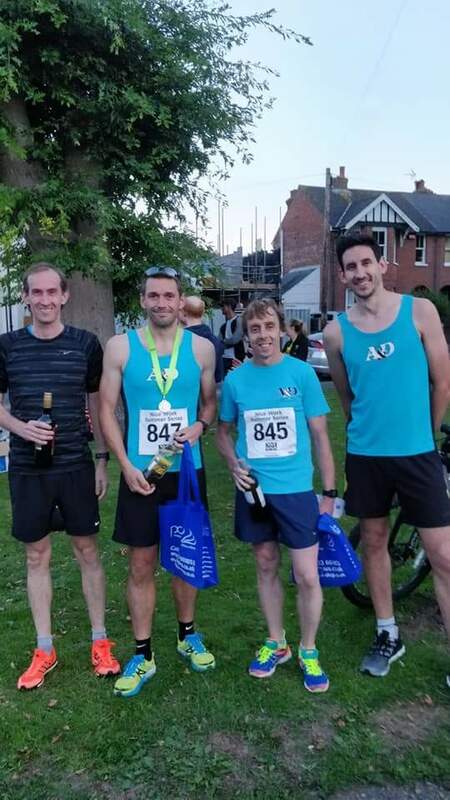 Scott Lynch in 19m:30s (3rd), Mark Attenborough 19m:58s (4th), Becky Macey was 1st lady home in 21m:02s (6th), Stuart Nunn in 21m:45s (7th), Aaron Homewood 23m:03s (9th) and Shaun Snowwolf-Harris in 24m:20s (10th). Mark Cleworth crossed the line next in 24m:20s (11th), Sandi Mortimer finished 1st in age category in 24m:22s (12th), Sarah Homewood in 27m:12s (17th) and Lucy Johnstone in 28m:18s (20th). 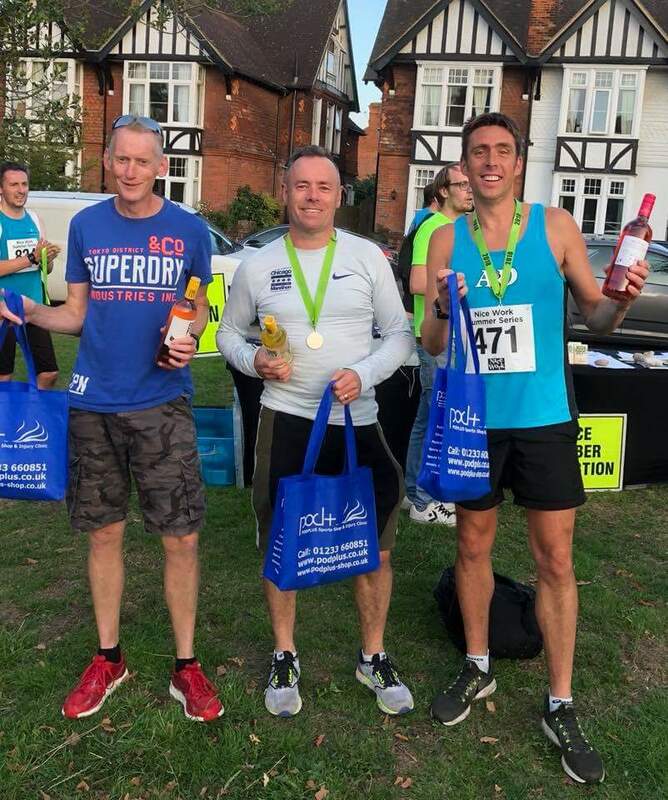 Scott Lynch and Adrian Moody took on the Aylesham 10k on Sunday. The hilly course was made more difficult on the day by a stiff wind but Lynch managed to complete the course in 42m:13s finishing 4th. Meanwhile Moody crossed the line in 45m:45s in 11th place. Rhian Shrimplin and Anthony Brown travelled to Bath for the Two Tunnels Half Marathon and 10k respectively. The race takes in some of Bath’s beautiful attractions as well as boasting the longest underground section of any running race in the UK. The disused railway tunnels have now been converted into a shared space for cyclists, runners and walkers. Rhian Shrimplin completed the half marathon in 1hr:56m:28s and Anthony Brown finished the 10k in 45m:28s. Dean Bracken made a return to parkrun and finished 11th for the club on Saturday in a time of 20m:31s. He was followed by Tom Green in a new personal best of 20m:39s (13th), Dan Green in 20m:40s (14th), Mark Harrison in a personal best of 20m:42s (15th), Paul Moses in 20m:43s (16th) and Mark Attenborough in 20m:57s (18th). Mark Carlton finished in 22m:35s (31st) with Don Dewar in 23m:07s (37th), Neil Woodham in 23m:26s (41st), Scott Lynch in 23m:41s (48th), Filiz Salih 23m:42s (49th), Jon Wells 23m:50s, John Fidge 25m:36s, Keith Lynn 26m:41s, Chloe Green 26m:57s, Becky Hodgson 31m:13s, Ann Fidge 32m:19s and Rod Kessack 55m:01s. Meanwhile, around the country, Anthony Brown completed the Poole parkrun in 26m:08s, Rachel Jenkins ran the Weymouth event in 30m:54s, Terry Sellen travelled to Bognor Regis and ran 23m:48s, Shelly Blake ran the Lancaster event in 32m:53s, Andrew Noble finished 6th in Foots Cray in 19m:44s and Sarah Taylor ran the Malling parkrun in 34m:20s . Closer to home, Jon Pearce came 1st in the Folkestone parkrun in a time of 17m:09s followed by Rob Barton in 19m:15s (9th), Shaun Snowwolf-Harris 25m:38s, Deborah Payne 34m:37s and Emma Jenkins in 36m:07s.